Just yesterday I was chatting with a friend on Twitter about Sprinkles Key Lime cupcakes. We are headed to Houston this week and they have a Sprinkles bakery. And in the summer time they have an amazing key lime cupcake. Unfortunately it isn't on the menu while we are in Houston. Boo! 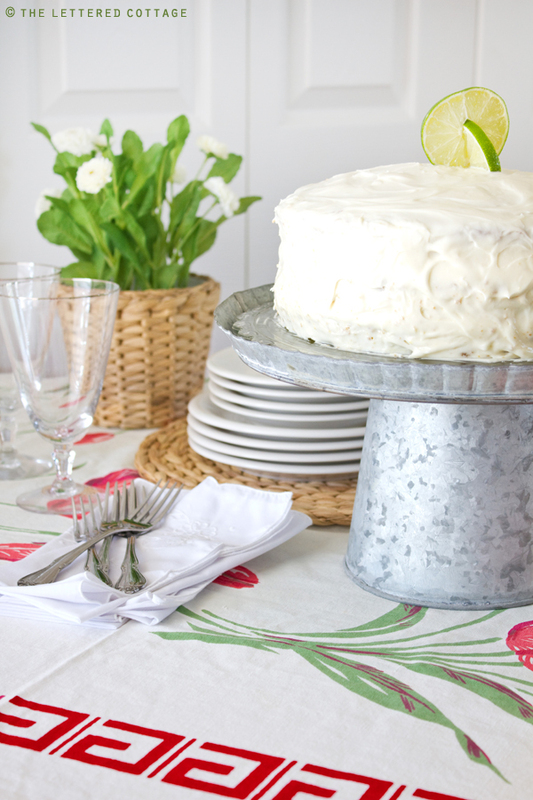 And then I stumbled across this recipe for Key Lime Cake from The Lettered Cottage. This is going right to the top of the summer baking list. If you want to make yourself up a key lime cake (or cupcake) you can get the recipe for Kev's Mom's Key Lime Cake HERE.. I read that post today too and decided that my hubby needs this Key Lime cake for Father's Day. I live in the Houston area and am now motivated to head on over to Sprinkles. Heidi, you will love it! So many yummy flavors! Hi! I would love for you to join my linky party. It's called a Themed Baker's Sunday where this week's theme is cakes! But you only have until tomorrow night to enter in! Then next week's theme is cupcakes!